Lloret de Mar is located about 70 km north-east from Barcelona on the Costa Brava. From Girona the distance to Lloret de Mar is about 40 kilometres. The city with more than a thousand-year old history is a party town now, about 100 nightclubs and bars make the city a more attractive place mainly for many young people from all countries. People who love the beach during the day and parties at night, are at the right place. A quiet spot can hardly be found here. Unless you are here in winter, then you can enjoy a lot of sand beaches and the beautiful landscape of the Costa Brava. The climate is Mediterranean, therefore very warm in summer, but not extremely hot. In the winter chilly and too cold to swim, but it barely goes below 0 degrees. In Lloret de Mar, two languages are spoken: Spanish (Castilian) and Catalan. In the tourism sector people also understand English and French. Lloret de Mar has three access options (see also our map): From the south, the coastal highway C-32 from Barcelona to Lloret de Mar. At the end of the C-32, take the N-II towards Malgrat de Mar and then turn about 2 km before Malgrat in the direction of Palafolls - Blanes on the G-682. From the north, from the direction of France, the access is via the AP-7 to Exit 9 (Lloret de Mar), the last kilometres are on the road GI-512, which will become the CI-600 in the direction of Blanes and is the GI-682 to Lloret de Mar. The third way is through Tossa de Mar. From Tossa de Mar go on the GI-682 towards Lloret de Mar. Lloret de Mar is well signposted, you can find your way there without a road map. After your arrival in Lloret, there are various public and private parking space where you are able to park your car for the duration of your stay. Some of the hotels have their own parking places. There's a direct bus connection from Terminal T1 and T2 to Lloret de Mar. The duration of the trip is about 1 hour and 45 minutes. There's no need to go into the city centre of Barcelona. The so called Sarbus (Sarfa) goes to Lloret. You can find a road map on the website of Sarbus. The Sarbus (Sarfa) goes directly from the airport to the bus station of Lloret de Mar. Select Launch "AEROPORT DE GIRONA" on the timetable on the website in order to look at the roadmap towards Lloret. A you can book a private transfer to Lloret de Mar on our booking page. You pay a fixed price, which is often cheaper than a taxi. It is also much more comfortable than public transport, especially with lots of luggage. Lloret de Mar itself is not particularly large, you can most easily walk. But there is public transport. The buses also connect Lloret de Mar with the neighbouring places like Blanes, Tossa de Mar or Malgrat de Mar, also very beautiful beaches, and the nearby beaches of Lloret. Daytime is probably spent best swimming at the beach. There are also many hiking trails around Lloret de Mar, which lead you through a beautiful landscape. In the evening over 50 discos, night clubs and pubs open their doors, making the night into day. In addition, there are countless bars and restaurants. Lloret de Mar is more than just beach and sun, the city has a rich cultural and natural heritage. The city administration is trying to confront the party image(this is a good translation) by promoting attractions and various cultural events. Most visitors come probably because of the beach here. The "home-beach" of Lloret de Mar is a grainier sand beach with a length of about 1.650 meters. It is supervised from 15 May to 15 October 10:00-18:00 (in the summer 10:00-18:30) and cleaned daily. More also very beautiful beaches are located in north-eastern or south-western direction, which are driven to by a bus but which you can still reach by foot. The beaches and bays in Llorets 7 km long coastline are awarded each year with the European Union blue flags and the predicate "Q" of the Spanish Institute for quality tourism. 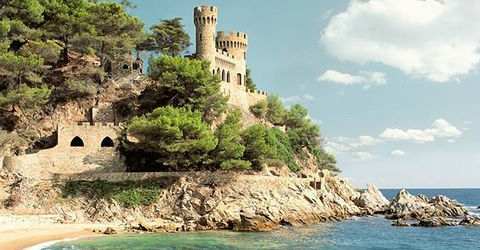 This medieval fortress from the early 11th century is located on the hills, which separates Lloret's beach from the one in Fenals. However, only the foundations and the tower are preserved. The castle was expanded to a museum, to present the Catalan culture in the Middle Ages. Open from 10-17:00, Admission: € 3.00, concessions: € 1.50. Very well known and a typical representative of the Catalan Art Nouveau is the in 1522 privied church Sant Romà. The church was partly secured as a protection against pirates of the Mediterranean. At the beginning of the 19th Century, the church was rebuilt with the money from returnees from North America (indianos) in today's visual style. The parsonage was built in Art Nouveau style. You should visit even the cemetery, if you are interested in Modernism. It shows the cemetery culture of Catalan Art Nouveau in a wonderful way. The "indianos", rich returnees from North America who settled in their old homeland, built some magnificently buildings. The Maritime Museum is in one of those buildings in the Passeig Camprodón i Arrieta, 1-2. It is open in summer from 9-20:00, Sunday from 9-13:00. In winter the opening times are shorter. The Santa Clotilde garden is a very nice park on the steep slopes with a wonderful view over the sea. It was built in the style of the Italian renaissance. Here you will find many fountains and small ponds. It is a must see in Lloret de Mar.